Few bands wave the Cali flag as high as Best Coast. The surf-rock duo of Bethany Cosentino and Bobb Bruno hails from Los Angeles and cites the city as inspiration number one. As such, Best Coast’s music is sunny, mostly upbeat, and brimming with the kind of immediate, first-person lyricism that you would expect out of a twenty-something Valley Girl who pens songs from her bedroom. In 2010, Best Coast made its mark with Crazy for You, an infectiously lo-fi debut that found Cosentino pairing her dear-diary-style lyrics with heaps of catchy hooks and fuzzy guitars. Last year, the band returned to the fold with The Only Place, a slightly slicker offering dedicated to (what else?) the Golden State. This summer, Best Coast will follow up The Only Place with a new EP, and this Thursday, the band heads to UCSB for a show at The Hub. We recently caught up with Cosentino to talk about touring with Green Day and her newfound celebrity. As a California kid who grew up in the ’90s, the opportunity to go on tour with Green Day is a pretty big deal. Did you freak out a bit when you found out? Yeah, I was definitely shocked when we got asked. Like, I couldn’t believe they wanted to take us on tour. I grew up listening to Dookie, so it was like one of my childhood idols asking to take my band on tour. It was totally awesome. How did the shows go? They went really well. It was a weird adjustment for sure — to play on huge stages like that to audiences that don’t really know who you are, in venues that hold over 10,000 people. That’s not something we are used to, but it was a cool experience for us. Green Day have a lot of young fans, and young people seem to really like Best Coast, so there were some nights where kids would get really excited about us. Have you noticed any major differences to touring behind The Only Place versus the tours you did for Crazy for You? The biggest difference is just our band really. We are a four piece now; it’s Bobb, Brett, Brady, and myself. All names that start with B! I think we have a bit more fun on the road as a band now. Before it was kind of like we were burnt out, but we took a pretty long chunk of time off from touring in between albums and I think that got us excited about playing shows again. Do you feel like you’ve adjusted to life in the spotlight? That is really something I don’t know that I will ever get used to. It’s really flattering when someone recognizes me out in public and asks for a photo or an autograph, but I’m still just like, “What? Huh? You know who I am?” It’s not really a thing you ever expect to happen to you, so when it does, you just kind of can’t believe it’s happening. It’s weird that people care about my personal life and my business because in my mind, I’m just the same person I was before this band even started. The transition between Crazy for You and The Only Place was kind of a big one for Best Coast. How does the forthcoming EP fit in? The EP is kind of like the baby of Crazy for You and The Only Place. It’s somewhere down the middle of both records. It’s not too lo-fi, and it’s not too hi-fi. The songs are a lot more upbeat than the last record, but there are two ballads on it. The ballads on the EP are pretty heavy, though. I was really inspired by Mazzy Star. You will hear that influence for sure. Lyrically and thematically, how would you compare it to either of the two full-lengths? I mean, I write what I know about, and that’s life. That’s just how it’s always going to be. I write about what I’m going through, or how I’m feeling — and that’s what I’ve done with every piece of music I’ve ever written for Best Coast. The EP will be along those lines as well. Can you share any details about it? We really don’t have any information about it other than it’s done, there are five songs and it was recorded in L.A. with our friend Wally Gagel. Wally recorded our 7″ for Record Store Day and we really liked working with him, so we went back in to do the EP with him. With The Only Place, you spoke a lot about returning home to write. Are you opposed to writing on the road? I don’t write on the road. I don’t like to write around other people. I feel like when you’re writing a song, you’re going through all sorts of stuff that is weird and awkward and embarrassing, and I just don’t want people to hear or see me doing those things. Of course I could write in a hotel or something, but I don’t really find that inspiring at all. I write all of my songs in my bedroom either sitting on the floor, or sitting on my bed. That is where I feel inspired. Can you talk a bit about your songwriting process? I pretty much just sit in my room and mess around on a guitar until I come up with some type of melody or sound that I like, and then I start singing a melody along to it, and then I work on lyrics. After my demo or “draft,” as I like to call them if the song is done, I send them to Bobb and he finishes them off. I give him a brief idea of what I want the songs to sound like in the final process and then he works on making that happen. We are truly blessed to have the kind of relationship we do musically. I don’t know of any other band that operates the way that we do, but we have totally made it work. You guys also put out a special 7″ for Record Store Day. Are you a big vinyl collector? I used to be more of a vinyl collector, but now I’m kind of guilty of being one of those people that buys everything online. I like to own the physical copy of some records, but if I’m just hearing a band or an artist for the first time, I just usually buy their music on iTunes. I listen to music all the time when I’m flying, and considering I’m flying just about every single week, I need good music on my phone iPod to listen to. Favorite record shop in L.A.? Amoeba. They just have everything you could ever think of and I’ve been going there since I was a teenager, so I have fond memories of it. You guys have been playing a handful of college dates. Do you notice the vibe change when you’re playing on campus? I mean, college kids definitely like to party [laughs], so some of our college shows can be really raging and fun. I think just playing to younger people in general is more fun. Adults kind of take shows more seriously and stand there and analyze what’s happening onstage, and kids and young adults just want to have fun and listen to the music. 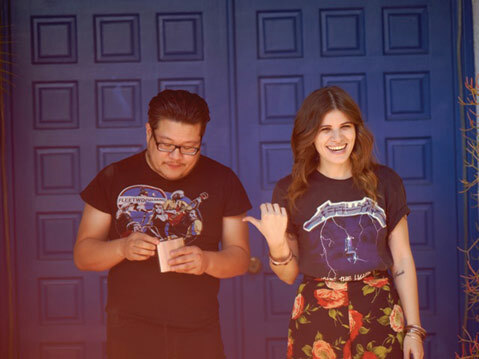 Best Coast plays UCSB’s The Hub on Thursday, May 9, at 8 p.m. Call (805) 893-2064 or visit facebook.com/asprogramboard.